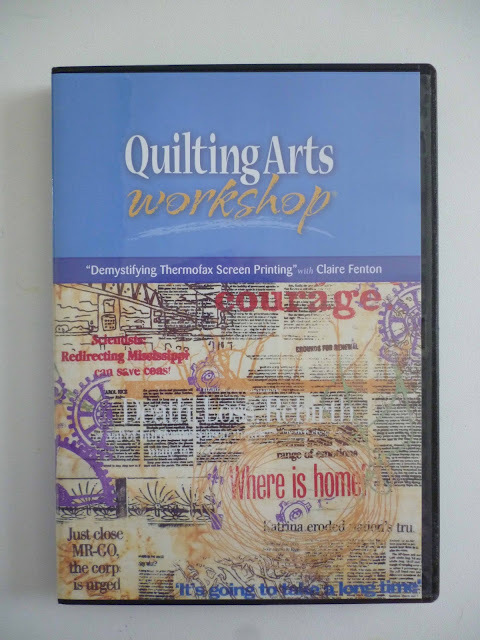 This is a Quilting Arts DVD on using thermofax screens. Leave a comment to win it. Something I've always wanted to try! Thanks for the opportunity. OH! No time for new ideas but... Luv the print texture on the cover. Since I am decluttering the art room I'm sure to have a spot for a new technique DVD! Happy summer! I love playing with the screens that I have. Would love this DVD. Thanks. Looks like a great DVD! This looks very cool, and I'm plunging in in any case! This looks interesting. Thanks for the opportunity to learn. Really, just a "comment"!! OK...and here it is! Thanks!! I LOVE thermofax screens and would like to learn more about them. On my list of techniques to try. I think the video might be good for reference. Thanks! Something I have always wanted to learn more about. A most generous offer. I'm ready to screen! I'm starting to experiment with surface design after several years of dyeing my own fabric. Thanks for the offer! Looks like lots of fun. I love to screen print. Carol, you won. Can you contact me with your mailing address using the "contact form" below? I'd love to try screen printing , thanks for the chance . You are always so generous! thanks for that! I have never worked with a screen printer.